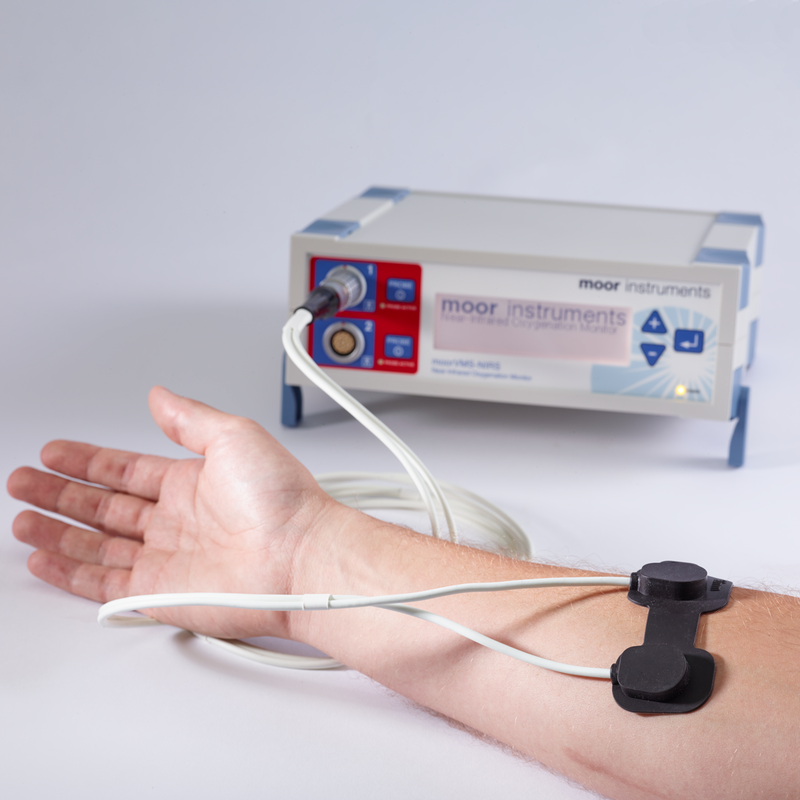 The moorVMS-NIRS near infrared spectroscopy monitor is designed to assess oxygenation status in deeper tissues non-invasively, muscle and brain for example. Dual channel module: allowing you to assess and compare two sites simultaneously. Compatibility with existing moorVMS family products and software: combine modules for a multichannel system to your own specification. 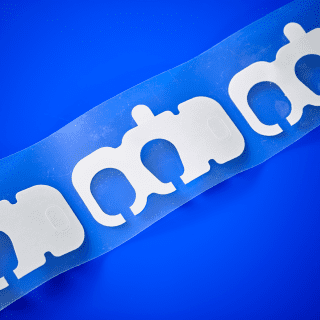 Three probe holders: 30, 40 and 50mm separation offering sampling from three different tissue beds. 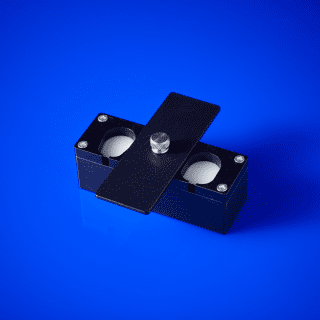 Add laser Doppler flowmetry (moorVMS-LDF) or white light spectroscopy (moorVMS-OXY) measurements: with provision for probes within the NIRS probe holders. Easy viewing: High contrast, ice white, backlit display. Advanced Windows™ compatible moorVMS-PC software: with extensive analytical features, batch processing and report templates. 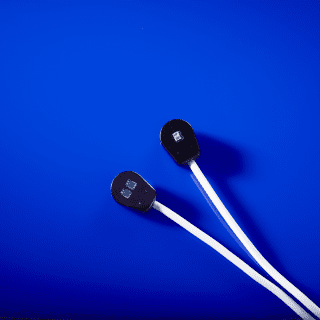 Highly connectable: As well as the visual output, all monitors feature analogue outputs (0-5V) and digital (USB) real time data transfer. Factory calibrated: no need for probe pre-calibration. 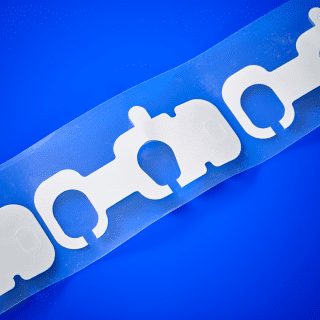 Medical grade design: for clinical research applications. Multi-lingual training DVD: for continual reference. Reliability: 3 year manufacturers warranty as standard – no servicing requirement. Annual service plans extend the warranty to 5 years. This section lists the more common questions our customers have with regards to the moorVMS-NIRS. If you have a question you would like answered that does not appear below then please email us. We are happy to help! Q. What parameters does the moorVMS-NIRS monitor measure? A. 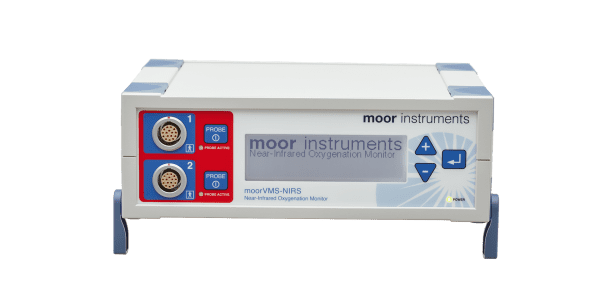 The moorVMS-NIRS monitor measures absolute tissue haemoglobin concentration (oxyHb, deoxyHb and totalHb), oxygen saturation (SO2), non-invasively and in deeper tissues such as muscle and cerebral tissue. A. NIRS offers the possibility to sample oxygenated haemoglobin in deeper tissues such as muscle and cerebral tissue. The information can be used for clinical research applications in critical care and exercise science for example. Oxygen saturation is a most crucial parameter for the assessment of the oxygen supply of tissue. Q. What is the measurement principle used by moorVMS-NIRS? A. The moorVMS-NIRS is based on the theory of near infrared spectroscopy. It measures the absorption characteristics of the sampled tissue for near infrared light which is predominantly determined by haemoglobin. Q. How is moorVMS-NIRS tissue oxygen saturation different from other measures of oxygenation (SpO2, VLS, tcpO2)? A. The moorVMS-NIRS tissue oxygen measurement using near-infrared spectroscopy (NIRS) is also a measure of the local haemoglobin saturation at the measurement site. The difference lies in the light source, wavelength range (visible region or near infrared region) and algorithms for the derivation of the tissue oxygen saturation. NIRS has been primarily developed to monitor deeper tissues such as muscle and brain while moorVMS-OXY, based on the visible light spectroscopy (VLS) measures oxygen saturation in the superficial layer of the tissue. Both moorVMS-NIRS and moorVMS-OXY are sensitive to the microcirculation, i.e. measure within the smaller blood vessels rather than arteries or larger veins. VLS is a measure of the percent haemoglobin oxygen saturation in the capillaries and venous area of the tissue microcirculation and therefore reflects changes in the local conditions of supply and consumption in the tissue. Tissue oxygen saturation is generally lower than arterial oxygen saturation (SaO2) and pulse oximetry saturation (SpO2), and is more close to venous oxygen saturation (SvO2). SpO2 is measured with a pulse oximeter, is the most widely used measure of haemoglobin oxygen saturation. The primary difference is that SpO2 relies on the difference in path length during the pulse cycle to calculate oxygen saturation so that it only measures arterial oxygen saturation. This gives a good indication of lung and heart function, but it gives no information about tissue oxygenation and oxygen uptake by organs as SO2, measured with moorVMS-NIRS. In addition, because a pulse oximeter is dependent on detecting the pulse of haemoglobin in the artery, SpO2 requires a pulsatile flow while SO2 readings do not. tcpO2 is transcutaneous measurement of the oxygen partial pressure. It uses an electrode to heat the underlying tissue to create a local hyperaemia. This means that the transcutaneous measurement values represent the maximum capacity of the vascular bed and tissue to deliver oxygen and transport carbon dioxide away. Therefore, tcpO2 value is close to arterial oxygen saturation and is not a measure of tissue oxygen saturation at normal condition as measured by moorVMS-NIRS. 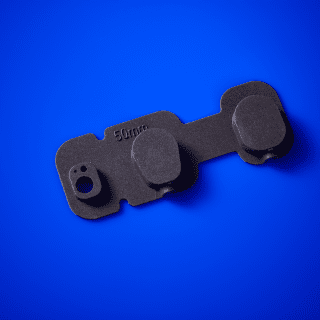 The tcpO2 method requires heating the skin tissue to 40°C or higher in order to make a measurement, so it takes several minutes to have the first reading and is not suitable for long-term monitoring. In comparison, moorVMS-NIRS is a non-invasive, much quick and convenient method for tissue oxygenation measurement. 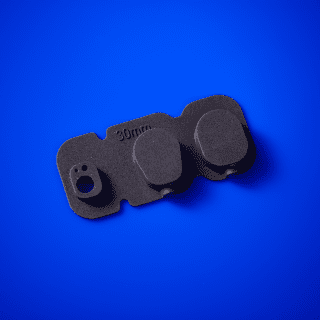 Also, due to the relative large electrode size, tcpO2 cannot be used for measuring oxygen of the internal tissue and in combination with laser Doppler monitor for blood flow measurement at the same site. Q. What is the measurement depth of moorVMS-NIRS? A. The actual sampling depth depends on the probe holder used and the separation (30, 40 or 50mm) and tissue characteristics. In general, the probe with wider separation between delivery and collecting fibres has deeper measurement depth. Physical models predict that the measurement depths range from below 10 to more than 20 mm, with a mean depth of about 10 – 15 mm For SO2 the sensitivity to the upper tissue layer (about first 2 mm), i.e. skin, is suppressed. Q. What is the fastest acquisition rate for moorVMS-NIRS? A. The moorVMS-NIRS is capable of taking measurements with a rate up to 5 Hz, with system output at 40 Hz to ensure compatibility with VMS-PC software packages. Q. How does skin pigmentation (melanin) affect moorVMS-NIRS measurement? A. As for any device based on reflectance spectroscopy, very strong skin pigmentation might compromise its performance. In such extreme cases, a warning message will be displayed and it is suggested to try a probe holder with reduced separation. The reading of SO2 itself is to a large extent independent of melanin content in the skin. (reason: there is no integration time setting, the only way to overcome high absorption is by reducing probe separation. If the measurement fails with 30mm separation then measurement will not be possible). A. Tissue oxygen saturation is generally lower than arterial oxygen saturation (SaO2) and is more close to venous oxygen saturation (SvO2). Measurement values depend on target tissue site, skin temperature, patient conditions and oxygen supply and extraction in general. For tissue of large muscle, normal values are in the range of 65 – 80 %, while it might have values of below 40 % or even 30 % during heavy exercise or hypoxic conditions. Other tissue types, like adipose tissue, might have low SO2 values during normal conditions. Q. How do I choose which probe holder to use? A. The moorVMS-NIRS is supplied with three probe holders with 30, 40 and 50 mm separation. The measurement depth will be deepest with the wider separation, and the sample volume larger. Please consult our sale engineers for more details. We are also happy to discuss any special probe designs or modifications to standard. Q. Do I need to calibrate the moorVMS-NIRS probe before use? A. No. 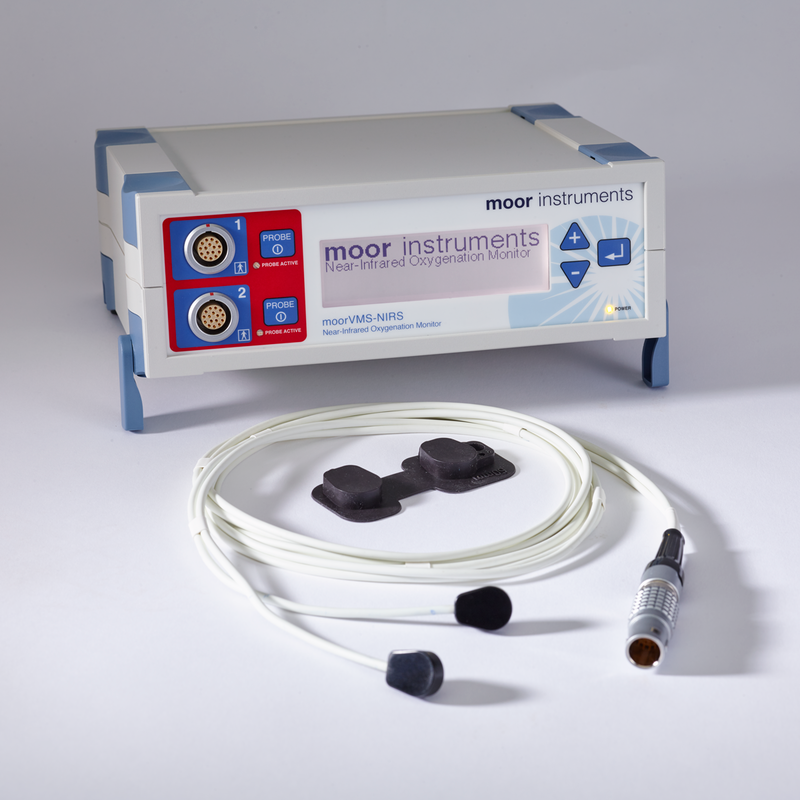 The moorVMS-NIRS is factory calibrated for each type of probe during manufacture. A. Yes. High probe pressure will press blood out of the tissue and therefore reduce SO2 and totalHb on skin and deeper tissues. So changes in SO2 and totalHb are not errors in the instruments or the method but rather an artefact due to real changes in the sample volume. 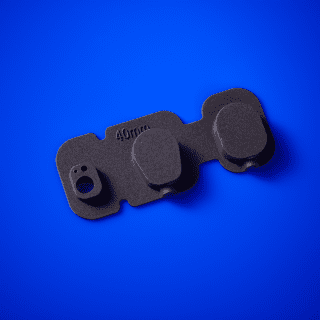 All the moorVMS-NIRS skin probes are supplied with probe holders and adhesive discs, which will hold the probe on skin firmly with neutral contact pressure. Q. Is it possible to save the absorption data and measurements for post-analysis? A. Yes. The absorption data (raw and reference) and haemoglobin parameters can be continuously saved for post measurement analysis in a text file format using moorVMS-PC software. A. Yes. The moorVMS-NIRS can be used with the moorVMS-LDF laser Doppler monitor and/or moorVMS-OXY to simultaneously measure SO2 from deep tissue as well as SO2, blood flow and temperature from superficial tissue layers simultaneously. 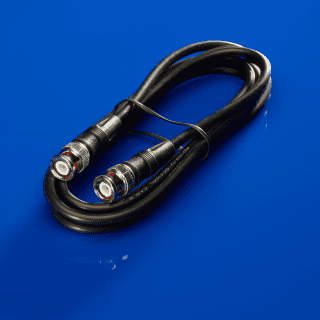 Dedicated probe ports are provided on the VMS-NIRS holders. Q. Can I use moorVMS-NIRS with other protocol modules? A. Yes. The moorVMS-NIRS forms a modular system when used in combination with the LDF monitor, Skin heater, Iontophoresis controller and Pressure controller. When used in this way, the instruments will be controlled and monitored via USB using the moorVMS-PC software. The moorVMS–DAQ is also available to integrate 8 channels of other physiological / analogue data from other systems found in the laboratory or clinic. A. No. The moorVMS-NIRS is a non-invasive device hence causing no damage to target tissues. The light induced heating from the probe tip is negligible. Therefore, moorVMS-NIRS is suitable for long term monitoring. LCD screen providing display of oxygen saturation SO2. 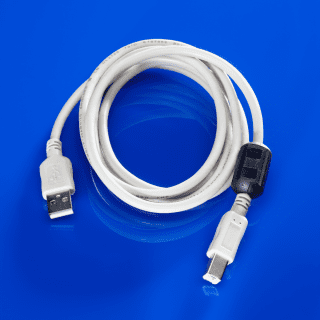 USB interface for connection to PC. Analogue outputs: BNC sockets, 0-5V. All outputs have independent user selectable scaling. Power source: Universal voltage, 100-230V AC, 15VA, 50 to 60Hz. Operating environment: Clinic or laboratory, excluding domestic. Just plug in to start monitoring! 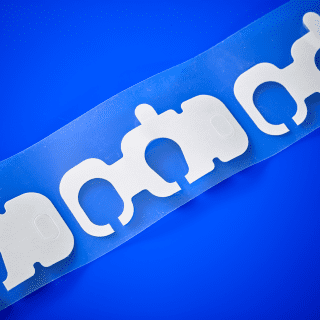 Three probe holders are available with dedicated double sided adhesive pads offering separation of 30, 40 and 50mm between emitting and detecting heads. This alters the measurement depth with a wider separation offering deeper penetration. Access ports are also provided enabling you to add laser Doppler (moorVMS-LDF) or white light spectroscopy probes (moorVMS-OXY) for simultaneous tissue blood flow and superficial tissue oxygenation. Probe materials selected are biocompatible for safe human use allowing cleaning/ disinfection between patients.